Hamilton Sinkler satin nickel floor registers have an easy drop in installation that requires no tools. These decorative floor vents are made from solid brass and can withstand heavy foot traffic. Plated nickel floor registers will not rust unlike other steel registers out on the market. Our decorative floor vents come in 19 sizes to fit your needs. These nickel floor registers come equipped with a metal damper which will open and close off airflow. Use the registers in both heating and cooling situations. The unique decorative floor vents have a vertical line pattern that will work with any decor style. 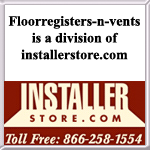 Tip: When ordering the decorative floor vents, be sure to measure the floor opening and not your old floor register. A 6 x 6 nickel floor register will fit into a 6 x 6 floor opening. All faceplates will have an additional 1 1/2 inches for installation purposes. Important: Decorative floor vents can take 10 to 12 weeks to ship out once an order has been processed. Find a variety of decorative floor vents for your home in the finish and size you need. Create a complete look by purchasing our nickel wall registers in the same vertical design. Use our Hamilton Sinkler nickel floor registers to improve the look of your home, at a price you can afford. Order today.